Australia’s Victor Nagbe was the first combatant to reach the final 16 when he overcame two opponents to move into the next stage of the tourney. In his semifinal bout he faced off with Spanish fighter Elam ‘Black Panther’ Chavez. The bout was a showcase of Nagbe’s cool, calm and collected approach to the fight game. He fought a very smart fight from the opening bell to the climax of the third and final round, taking a unanimous points victory. In his final bout he squared off with Chinese fighter Hu Yafei, who had earlier beaten Japanese boxer Shintaro Matsukura in his semifinal to progress into the final against Nagbe — Nagbe set the tone for the bout, coming straight out of the blocks with effective aggression and precise shots landing at will. He ended the hopes and dreams of Hu in the third round of the bout with some ruthless leg kicks pulverizing Hu’s already heavily damaged right leg, forcing the referee to call a halt to the action. Next up it was formidable Frenchman Yohann Drai’s turn to battle his way into the final 16 of the coveted Kunlun 70kg tournament. He did it the hard way: his semifinal bout with Serbian fighter Nikola Cimesa was a pulsating hard fought encounter from start to finish! The bout needed after three rounds, the judges scorecards read: 29-30, 30-30, 30-30, 29-30 and 30-30.....we were going to extension round after the majority draw decision was read aloud. The extension round didn’t disappoint the fans in attendance as both fighters left everything (bar the kitchen sink) in the ring. Again we went to the judges scorecards: 10-9, 10-9, 10-9, 9-10 and 9-10. Three of the judges went in favor of the Frenchman and he moved on to the final. His opponent in the final was Chinese boxer Feng Xingli, who had earlier beaten Czech fighter Michael Krcmar to book his place in the final to face off against Drai. The final came, Drai saw and Drai conquered his Chinese opponent with some crisp, beautiful knees in a dominating second round, a round which saw the Fairtex fighter solidify his prowess in the bout. After three exciting rounds of action we again went to the judges scorecards: 29-29, 29-29, 30-28, 30-28 and 29-28. 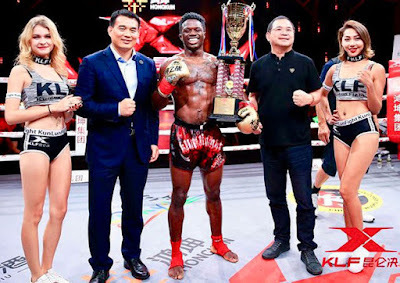 Drai did it, he overcame the formidable challenge of his Chinese rival to seal his spot in the final 16 of one of kickboxing’s biggest tournaments.